Take either Route 287N or Garden State Parkway north to NY State Thruway (I-87) north. Follow directions "From South & East (Albany)". Take Route 90 West to Amsterdam, Exit 27. After toll booth, take a right turn into Amsterdam. Exit to Route 30N when it veers off to the left. In Vail Mills, Route 30N will turn left and then right a few miles later. All turns are marked. Follow Route 30N approximately 1hour. You will see a 'Welcome to Speculator' sign on the left. CAMP-of-the-WOODS is one mile past the sign on the left. Take Route 90 East to Exit 31 in Utica. Take Route 8 North 65 miles to Route 30 South. 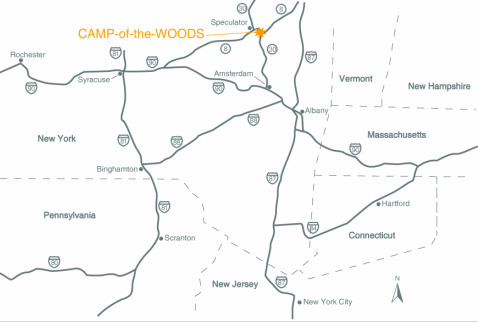 CAMP-of-the-WOODS is one mile south on the right. For specific driving directions from where you live, use either MapQuest or Google Maps. For GPS use 106 Downey Ave, Speculator, NY 12164.